Come join us for an unforgettable camping adventure throughout Botswana. This guided safari will take you on a journey of a lifetime combining exceptional game viewing with a fantastic camping experience by visiting Moremi Game Reserve, Khwai Community Area, Savute and last but not least Chobe National Park. minutes road transfer by car. Here we will spend our first night, where you will be briefed on your safari starting the next day. Our safari starts after breakfast and we head into Moremi for an all day game drive and picnic lunch before arriving at the campsite. Making up around one third of the Okavango Delta, Moremi offers swamps, rivers, flooded grasslands and tree-strewn plains that attract birdlife, fauna and big game in abundance. Permanent swamps and rivers teem with birdlife while seasonally flooded grasslands attract a wide variety of large fauna. Much of the dry land consists of Mopane veld, a species of tree that dominates much of Botswana: giant specimens regularly provide a surreal atmosphere unique to this area. The activities on offer in Moremi will be game drives. After breakfast and a short morning game-drive, we will head to the Khwai Community Concession. We will enjoy a picnic lunch en-route to Khwai and will likely arrive in camp in the afternoon – whilst the staff sets up the camp you will be able to relax a bit. To the east of The Moremi Game Reserve is the Khwai River, where seasonal floodplains and impressive riverine woodland meet. Wildlife is drawn to this river in great numbers, especially in the dry season. Spectacular game viewing is almost guaranteed. Activities on offer in Khwai will be game drives night and day. After breakfast and a morning game drive in Khwai, we will move North to Savuti. The next campsite in Savuti is a private site, so there will be no other groups camping nearby. We will enjoy some game viewing and a picnic lunch en-route. Savuti, part of the Chobe National Park, is most famous for supporting one of the largest prides of lions in Botswana. In the hot dry season members of the Savuti Pride (sometimes more than 25 in number) will gather at the waterholes. There, they prey upon other users, mostly Elephants, too satiate their hunger. Other predators are plentiful but elusive. Leopards favour the rocky hills while the open grasslands of the Savuti Marsh are the preferred hunting grounds for Cheetah. 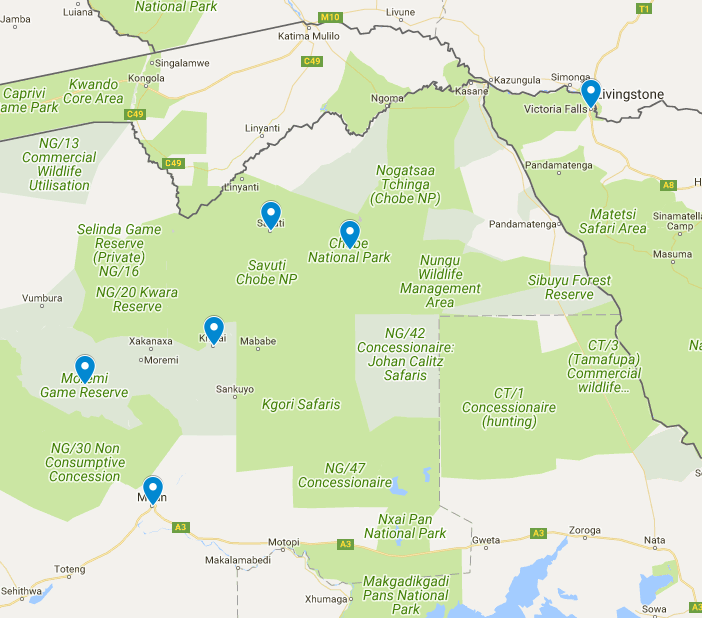 We can also see Zebra migrating from the Chobe River in the North to the Mababe Depression further to the south. Finally, the mysterious Savuti Channel inexplicably flows and ebbs dry, cutting off a vital supply of water for the resident Elephants. In recent history it spilled out onto the immense Savuti Marsh. After being dry for two decades, the Savuti River has started to flow again! The Savuti Marsh is revitalized – transforming the dry marsh into a magnificent wetland. Guests will enjoy game drives in this area only. Yet another early rise and we will head to Chobe National Park. We will explore this area by game drives and finish your Botswana adventure with a boat cruise on the day of departure in the morning. The Chobe River is perhaps the greatest attraction of the Chobe National Park; nowhere in Africa is better for viewing and photographing elephants. Forming the northern boundary of the park, the vital Chobe waterway attracts animals in great numbers during the dry season when water in the interior of Northern Botswana is scarce. The most impressive sight is the vast numbers of elephants found here. The river provides water for drinking, cooling off and even for play, while the grass on the floodplains is a vital source of nourishment. In season, the riverfront is teeming with thousands of zebras. They spend most of the dry season by the river, attracted by the guarantee of water and good grazing. Hearing the zebras’ far-reaching calls during the night while tucked up safely in your tent is one of Africa’s most memorable experiences. Incredible birdlife, good populations of game and large buffalo herds can also be found here. After enjoying your morning boat cruise on the Chobe river – the best way to say farewell to Botswana – a road transfer will take you across the Zimbabwean border. You will be taken to your guest lodge in Victoria Falls where you will stay your last night. Many activities are on offer here – please let us know should you want to explore the area further or extend your trip. You will be transferred from the guest lodge to the airport the next day for your flight back home.